Filip Forsberg is one of many Predators to have missed significant time this season, returning Jan. 7 after a 17-game absence. He has four goals and three assists in eight games since rejoining the squad. That’s a good omen entering the second half of the season. Nashville lost two-thirds of its top line and one of the NHL’s best defensemen to November injuries, but all three players have returned to the lineup. Right wing Viktor Arvidsson, tied for the team lead in goals (18) as of Jan. 19, missed 24 games with two injuries before returning Dec. 27. P.K. Subban, the Norris Trophy winner as the league’s best defenseman in 2013, suffered an upper-body injury three days after Arvidsson broke his thumb. That knocked Subban out of the lineup for 19 days before his return on the same day as Arvidsson. 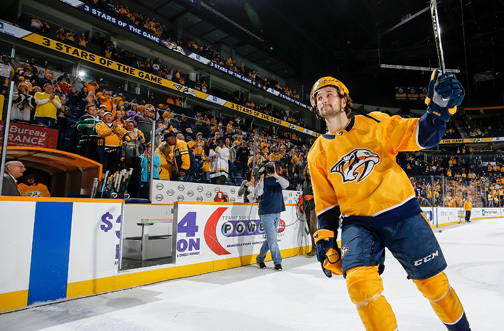 Then left wing Filip Forsberg, who also has 18 goals, joined the parade with an upper-body injury on Nov. 29. He missed 17 games before returning on Jan. 7. All three are on the power-play and penalty-killing units, which made their absence even more difficult. To Nashville’s credit, it didn’t sink. The Predators floated along with a 12-10-3 record between Arvidsson’s broken thumb and Forsberg’s return in a win at Toronto. The toughest stretch came from mid to late December when Nashville lost six consecutive games. The Predators’ depth kept them in the Western Conference’s top five and second in the Central Division behind Winnipeg as of Jan. 19 with the All-Star break drawing near. ESPN rated the Predators third in its NHL Power Rankings after week 15 – not bad for a team floating along through injuries. Arvidsson also missed three games with a lower-body injury shortly before breaking his thumb. Subban says he’s still trying to find his game since returning to the ice. Subban has been doing some extra skating on off days to improve his conditioning. The schedule didn’t do Subban and Arvidsson any favors, either. Washington is the defending Stanley Cup champion and Winnipeg ended Nashville’s season in the second round of the playoffs last season. Mattias Ekholm was Subban’s longtime defensive partner, but Laviolette paired him with captain Roman Josi for two games last week. That combined two of the league’s most offensive-minded defensemen. Subban is fine with not cycling the puck in the offensive zone, so he can play near the blue line to take advantage of his booming slap shot or one-timers. Winnipeg left wing Kyle Connor says he believes the biggest challenge to beating Nashville is dealing with its back end and the Jets are wary of the Josi-Subban pairing. Forsberg’s return completed the reunification of the JoFA Line, one of the NHL’s best with a combined 44 goals through Jan. 19. “Obviously, the last few games have been a step in the right direction for our whole team,” Forsberg said after a 7-2 rout of Washington last week. Center Ryan Johansen, the playmaker on the JoFA Line with a team-high 34 assists, is happy to have his wingers back. Predators goalie Pekka Rinne, who’s playing in Saturday’s All-Star Game along with Josi, appreciates the returning support in front of him. Arvidsson put an exclamation point on his return with a hat trick against the Capitals. Nashville still has three players out with injuries: center Kyle Turris (lower body), left wing Miikka Salomaki (upper body) and left wing Zac Rinaldo (undisclosed). The Jets feel the Predators’ pain because they’ve also been hampered by injuries. Three Jets are out of the lineup, including defenseman Dustin Byfuglien (6-5, 260, 25 assists) and left wing Nikolaj Ehlers (15 goals). Winnipeg pounded Nashville 5-1 last week, but Arvidsson (5-9, 180) scored the Predators’ only goal – a reminder of how talented the JoFA Line is. Winnipeg and Nashville got to know each other well last season when they played each other 11 times: four in the regular season and seven more in the playoffs. The Predators boasted the NHL’s best regular-season record, but the Jets knocked them off in a high-scoring playoff series. So Jets defenseman Josh Morrissey knows exactly what the Predators’ top line is capable of. Mark Scheifele (25 goals, 33 assists), who centers Winnipeg’s top line, enjoys competing against the JoFA Line.